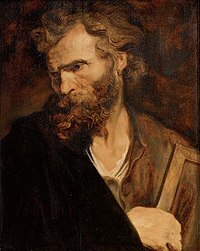 Jude, an aw kent as Judas Thaddaeus (Greek: Θαδδαῖος; Coptic: ⲑⲁⲇⲇⲉⲟⲥ; Syriac/Aramaic: ܝܗܘܕܐ ܫܠܝܚܐ), wis ane o the Twal Apostles o Jesus. ↑ Butler, Alban. "St Jude, Apostle". EWTN. Retrieved 27 May 2014. ↑ Lanzi, Fernando; Lanzi, Gioia (2004). Saints and Their Symbols: Recognizing Saints in Art and in Popular Images. Liturgical Press. p. 70. ISBN 9780814629703. ↑ "St. Jude Shrine, Yoodhapuram". Yoodhapuramchurch.com. Retrieved 16 December 2013. ↑ "Saint Judas". Encyclopædia Britannica. Retrieved 19 October 2015. This page wis last eeditit on 4 November 2018, at 00:07.